A recent survey released by Forrester found that Americans now spend as much time on the Internet as they do watching television. Forrester surveyed more than 30,000 people and found that the average American spends approximately 13 hours a week on the Internet and watching TV while offline. While the Internet was once thought of as something more popular among youth, the study also found that Gen X (31 to 44) and Younger Baby Boomers (45 to 54) are spending equal amounts of time using both forms of media. 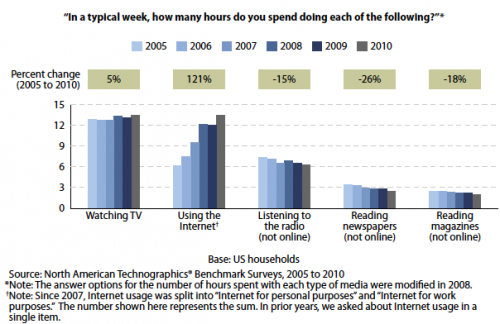 In the past five years, while TV use has stayed approximately the same, Internet use has increased by 121%. So what exactly is contributing to this popularity? One reason is mobile devices. The survey found that around a quarter of all online mobile owners now log onto the Internet using their mobile device. A second reason is an increase in shopping via the Internet, and a third is due to the popularity of social networking. The survey also estimates that these numbers will only continue to increase with 2 million new households being connected by the end of the year. In addition, 82% of households will have internet by 2015.